Today I began a journey of a different sort. I disconnected from Facebook and am opting, instead, to express my thoughts on platforms that give the opportunity for legacy and meaningful discourse. At the same time, I am acknowledging that I am a stranger and alien in this world (Eph 2:12-19) and that the dialog in that particular public square is more about “civilian affairs” (2Tim 2:4) than things that matter for the generations that follow, and indeed, for eternity. Am I backing away from the public square? No. I continue to believe that we should be in the world but not of the world. Yet, as I told a dear friend, posting words of wisdom is quickly lost in the haystack of fear, uncertainty, and doubt (FUD). Those who would spread FUD without wisely discerning the truth of what they’re posting have begun to far outweigh the caring and personal touches that once were the hallmark of this platform. The vitriol has reached such a noise level that truth is impossible to discern. I believe that the rhetoric is being used by the principalities of the air to create confusion even among those who want to follow Jesus as the Truth, the Way, and the Life. In another transition of leadership thousands of years ago, God told Joshua to be strong and courageous. (Joshua 1) He repeated this message several times until Joshua got it. God told him that I will never leave you or forsake you, so be strong and courageous. This is a message that is decried in our society today. A life with God is not a FUD life, but rather one of being strong and courageous. A life of faith requires conviction and confidence. God has told us that he has put government leaders into place (Rom 13). We can choose to believe that our God is sovereign over all of his creation … or not. If, indeed, God does rule over his creation, then what have we to fear. We should go forward being strong and courageous! Teaching this world, one person at a time, the meaning of the two great commandments is a mission upon which I have set myself years ago and one that I must once again take up renewing my energy with strength and courage. The next generation will lead in a very different world, but a world, that is no less under the sovereign watchful eye of the God of the universe. The efficacy of Christ’s work on the cross is not fading. It is and will be as powerful as it was in the days of the early church. So, at least for the moment, I must focus my energies on building up the next generation and put aside the civilian cares of this world, pressing on to the mark of the high calling to which we have all been called. In the picture with this post you’ll see a sword and a trowel. Nehemiah took on the mission to rebuild the wall of Jerusalem. 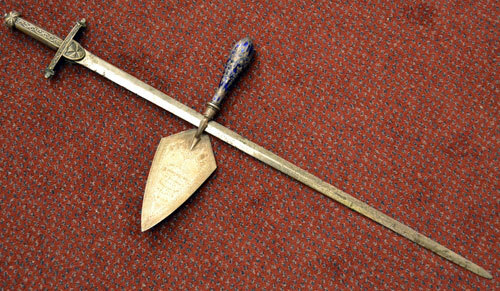 His workers needed a sword to defend themselves from the attackers and a trowel to continue building the wall. Nehemiah 4:17-18 says, “Those who carried burdens were loaded in such a way that each labored on the work with one hand and held his weapon with the other. And each of the builders had his sword strapped to his side while he built.” In the same way we need to be about the business of defending the faith while building up and preparing the next generation to carry on the work to with we have been called. God bless you all and let’s prepare today’s world for the world to come. I am encouraged as always. Thanks for the words of wisdom. Be blessed. God is with you. I enjoy your witness to the truth. I will continue to see you other places but will miss that truth on Facebook.